Peugeot has introduced its AL4 automatic gearbox on the 2.0 litre HDi diesel engine to join the already available 2.0 litre petrol 807 models, expanding the line-up to 20 variants. 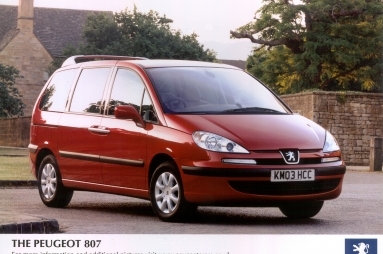 Sales of Peugeot’s 807 people carrier have exceeded company expectations since its launch in January, and the introduction of the automatic gearbox will maintain this momentum with customers looking for the ease and simplicity of driving an automatic. The award of five-stars by Euro NCAP, the highest possible crash protection rating, recognises the comprehensive active and passive safety systems of the 807. The standard fitment of Electronic Stability Program (ESP) on all 2.0 litre HDi diesel models ensures 807 is a safe place for families when they’re on the move. The automatic gearbox fitted to the 807 is fitted with "Porsche tiptronic control", the unit is compact, lightweight and has low maintenance. The gearbox has an electronic service monitor system, which indicates when the gearbox oil requires changing dependant on the gearbox operating temperature and usage. The gearbox is controlled by an electronic control unit (ECU), which in full automatic mode adapts itself to the driver’s driving style and road conditions, taking into account engine speed, vehicle speed and the position of the accelerator pedal. It then uses one of nine predetermined programmes: driving style (economy, standard, performance), road conditions (hilly, mountainous, steep descent) and ambient operating temperature (low temperature, high temperature, cold starting) when deciding when to change gear. Electronic control of the gearbox eases the task of driving and allows the driver to concentrate on the road, thus improving safety. With quicker engine braking, the gearbox offers further advantages when descending a steep gradient, or in sudden braking situations. Another new feature on the 807 2.0 litre HDi diesel automatic is ESP (Electronic Stability Program) which now comes as standard. The system provides a significant improvement in active safety while maintaining the car’s dynamic character and, of course, without diminishing the quality of the ride. Prices for the 807 2.0 litre HDi diesel automatic start from £21,100 for the 2.0 litre HDi diesel LX version, to £24,860 for the Executive SE 2.0 HDi.